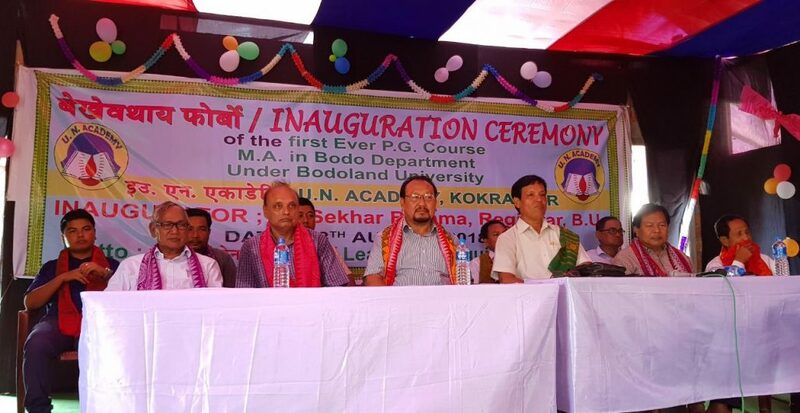 The Upendra National Academy introduced the post graduate course under Bodoland University at a function held at Chandrapara in Kokrajhar on Saturday. Registrar of Bodoland University Dr Sekhar Brahma inaugurated the post graduate (PG) course amidst large gathering of students, teachers and others. Talking to reporters, Krishna Gopal Basumatary, director of the UN Academy management board, said that the PG course has been inaugurated seeing the potentiality for higher studies among students in the region. The PG course has been affiliated under Bodoland University and so far nearly 30 students are getting admission in Bodo department. He said that the UN Academy institution have been spread in 13 districts of Assam like Kokrajhar, Chirang, Baksa, Udalguri, Sanitpur, Dhemaji, Golaghat, Golpara, Lakimpur etc. Basumatary said that the UN Academy institution has many challenges and the management is trying to overcome all the needs and problems those step by step. More than 16000 students have been pursuing their studies in 18 schools and colleges under the UN Academy. Basumatary hoped that by the year 2022, the UN Academy would be upgraded to a University. We have received academic books from Assam Govt. education department and publics and well wishers have been supporting us for the growth and development of our institutions. Among others, retired principals of Kokrajhar Govt College Surath Narzary,Dr Binoy Kumar Brahma,ex Rajya Sabha MP Urkhao Gwra Brahma,Director of Colleges of University Degree Course Dr Dinonath Basumatary,chairman of Upendra Nath Brahma Trust Dr Subung Basumatary were prominrnt attendees.